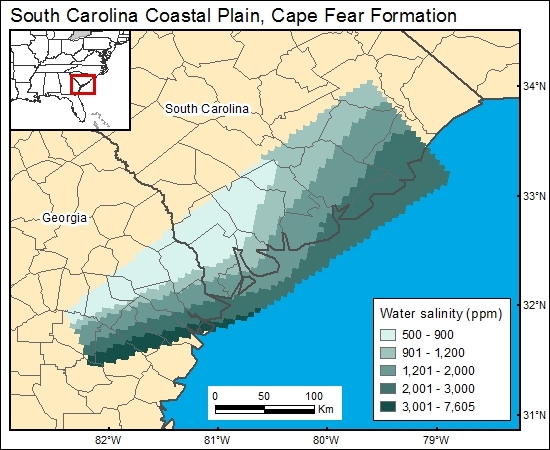 Several researchers have reported that salinity in the Cape Fear aquifer is moderately high but below 10,000 mg/L (Manheim and Horn, 1968; Brown and others, 1979; Lee, 1985; Miller and others, 1986; Miller, 1990). However, there has not been a systematic study of water chemistry in southeastern South Carolina because of low prospect for use. We used the map of Lee (1985) for the GIS, who referred to the Cape Fear hydrostratigraphic interval as the middle water-bearing zone of the A4 regional aquifer. We chose this map to grid (c12capefear) because it shows the regional distribution of dissolved solids. Miller, J. A., Barker, R. A., and Renkin, R. A., 1986, Hydrology of the Southeastern Coastal Plain Aquifer System, in Vecchioli, J., and Johnson, A. I., eds., Regional aquifer systems of the U.S.: aquifers of the Atlantic and Gulf Coastal Plain: American Water Resources Association Monograph Series No. 9, p. 53-77.